Hello, I'm back! What's the reason for such a gap in my blogging? Well, boring stuff like being really busy at work etc.... but also some new projects. One of the reasons I haven't been sewing much or posting much here is that I've been bitten by a new crafty bug -- embroidery. This is what I've been up to in my evenings over the past while. 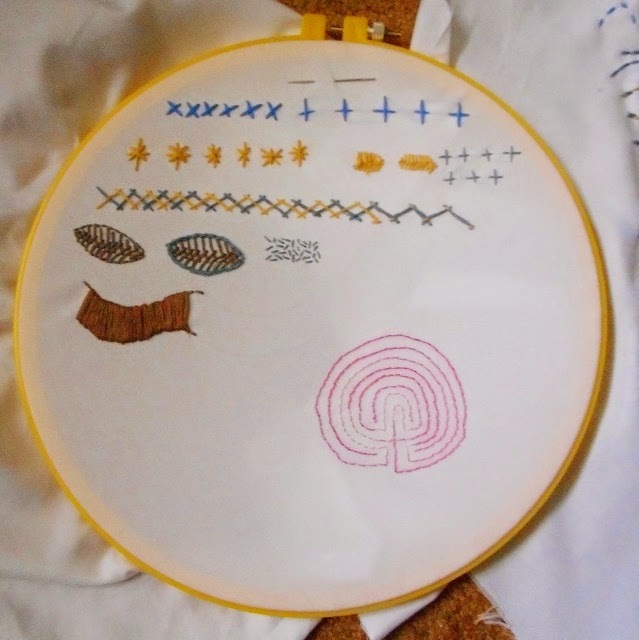 I saw a class on Craftsy -- Design It, Stitch It: Hand Embroidery with Jessica Marquez. (highly recommended -- and on sale now!) This reminded me that I'd always been interested in hand embroidery, and I was in the mood to learn something new. So I signed up and off I went, fitting in my lessons and practice in the odd minutes between work and meetings and so on. 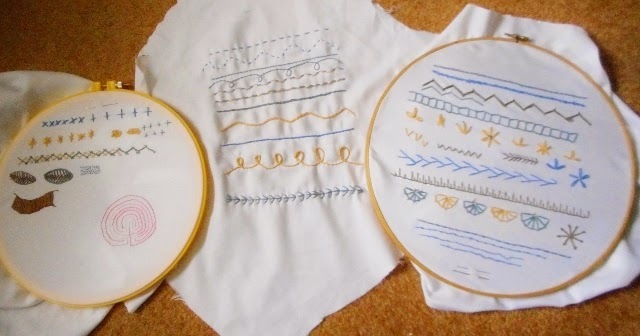 I've only got one or two more stitches to practice before I've worked my way through this really excellent class, then I'll have to branch out and try putting them together into a design. Here's a batch of stitches from the first couple of lessons -- very first try so the fabric was pulled a bit, and I realized I needed more practice, but still very enjoyable. So lots of stitching going on over here, and I'm having fun learning something new. Do you like embroidery? Do you have any great sources to share? I recently made the Zsalya dress by Kate and Rose, and their company also sells pretty Hungarian embroidery designs too. Are there any other pattern companies that include embroidery? But it's just about time for me to finish up a couple of the dresses patiently awaiting my attention on the sewing table, so hopefully the next post or two will have some finished sewing to show you, too! 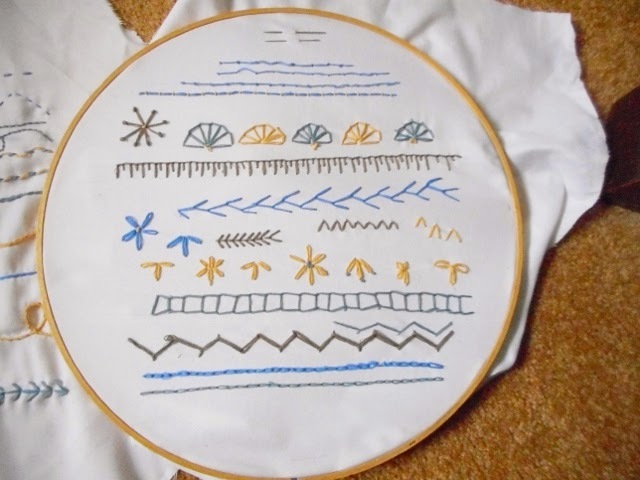 I am doing it too for my placemats right now, it's a very relaxing activity beside sewing. Yes, exactly -- very relaxing to do when not sewing! 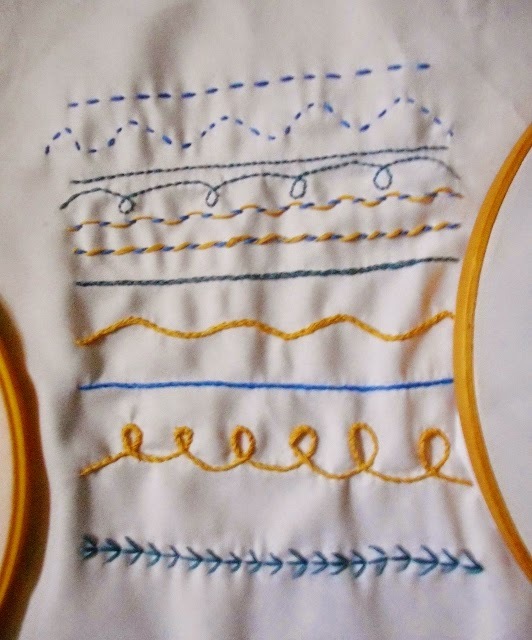 This reminds me of the sampler pieces my grandmother had me do when she taught me how to embroider. Such sweet memories :) Thanks for the memories :) Oh, I'm so caught up in my trip down memory lane that I almost forgot to say, great job!!! How lovely to have memories of your grandmother & embroidery! My mom tried to teach me when I was younger but it didn't stick...now I'm returning to it and trying to "sample" it all.